Bodhisena (Sanskrit बोधिसेन Chinese 菩提僊那) was an Indian Buddhist scholar-monk. 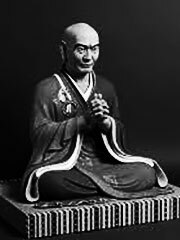 He visited Japan, arriving in August 736 on the invitation of Emperor Shōmu, to Sanskrit and Huayan Buddhism in many Japanese monasteries. Bodhisena also petitioned the emperor to found a temple on Mount Tomi, which he found to strongly resemble the mountain in India where Buddha preached, known as Vulture Peak.